North Central Wisconsin Workforce Development Board | NCWWDB Announces Recipients of its 2nd Annual Erhard Huettl – WIA Awards of Excellence! Workforce Development Area 6 – North Central Wisconsin Workforce Development Board (NCWWDB) recently selected and announced the award recipients of its 2nd Annual Erhard Huettl WIA Awards of Excellence. Nominees were solicited throughout the Workforce Development Board’s nine-county region, for the following three categories: Workforce Investment Act (WIA) Youth Program Participant of the Year, Adult Program Participant of the Year, and Dislocated Worker Participant of the Year. 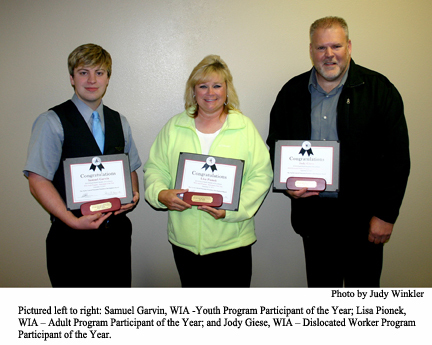 2014 – WIA – Adult Program Participant of the Year award recipient is Lisa Pionek of Milladore, WI. At the age of 45, Pionek made the decision to return to school to earn a degree. She was tired of living pay check to pay check and not being able to make ends meet. And, making matters worse, she was competing with high school students with better skills than she had. Despite great adversity, Pionek was determined to reach her goals. With the help of WIA’s Adult Program and Forward Service Corporation’s WIA Case Manager Jamie Arndt, Pionek managed to do just that, plus some! In August of 2011, Pionek earned her certificate in Biorefinery. In the summer of 2012, she earned her CDL and Heavy Equipment Certification. In May of 2013, she earned her Associate Degree in Renewable Energy. Lisa went from living in a friend’s garage with just an old couch for a bed—it had no heat, no stove, no bathroom, nothing—to total self-sufficiency and a job (in her field of studies) that she absolutely loves. 2014 – WIA – Dislocated Worker Program Participant of the Year award recipient is Jody Giese of Mosinee, WI.Giese lost his job of 23 years at Wausau Paper’s Brokaw Division in early 2012. After going through every emotion possible, he made the tough decision to take advantage of all the benefits and programs made available to him through the WIA Dislocated Worker Program. With the help of a career assessment program to identify his interests, he entered the Mechanical Design Technology Program offered at Northcentral Technical College in Wausau. Giese became a model student making the President’s List every semester and was awarded the Outstanding Graduate in the Mechanical Design Technology Program for 2014. The award recognized him for his 4.0 GPA, his design quality and his leadership skills. Today, Giese is employed as a Mechanical Designer at Greenheck Fan. The 2nd Annual Erhard Huettl WIA Awards of Excellence were presented during a ceremony held on September 25, 2014, at Northcentral Technical College in Wausau. This NCWWDB premier event is held each year during September in recognition of the month being officially declared “National Workforce Development Month”. The North Central Wisconsin Workforce Development Board is a public/private partnership between government and business that provides over-sight to area Job Centers and plans, administers and coordinates Workforce Investment Act (WIA) employment and training programs for Youth, Adults, and Dislocated Workers in the North Central Wisconsin counties of Adams; Forest; Langlade; Lincoln; Marathon; Oneida; Portage; Vilas; and Wood. Our purpose is to provide policy, planning, oversight and funding for local workforce development programs and address workforce issues for job seekers and employers as they emerge within our region. Visit NCWWDB’s website at: www.ncwwdb.org.